Built in 2017, Norma is able to provide you the ultimate sailing experience like never before. A very well balanced yacht which is also equipped with full-batten main sail promises you comfortable sailing in very good speeds. Accommodation is for 6 people in her 3 beautiful wide cabins. Her gently sloping 45o companionway let you have easy access to the harmonious interior of the yacht. With a layout of 3 cabins and 2 toilets, Norma is suitable both for families and friends. In the interior there is a large amount of storage place below seats and floor that can store all guests’ belongings and provision. 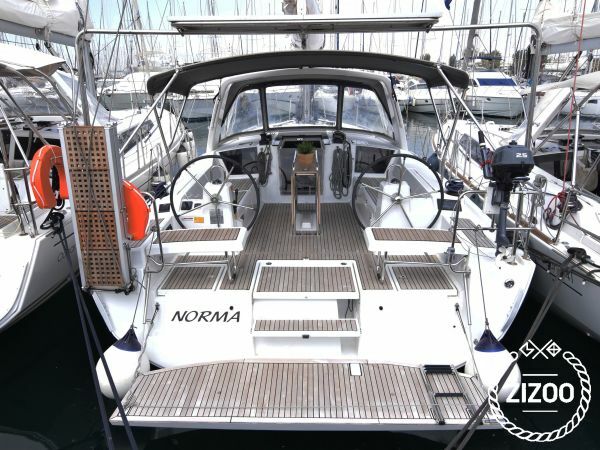 Mooring in ports is always easier with Norma because her bow-thruster allows you to have great maneuverability. A star feature is its swimming platform at the aft of the yacht which provide excellent protection under sail when is closed and direct access to the sea when is opened while preserving space and comfort in the cockpit.